Night cradles a Tyrrhenian sunset over Anzio Harbor. The beachhead was quiet when the 36th came in. When Fifth Army attacks in the south met with assured success, the 36th was promptly switched to the beachhead at Anzio. There, where a bitter stalemate had lasted from mid-January, preparations were underway for a powerful attack to breakout and link up with the forces moving up from the south. 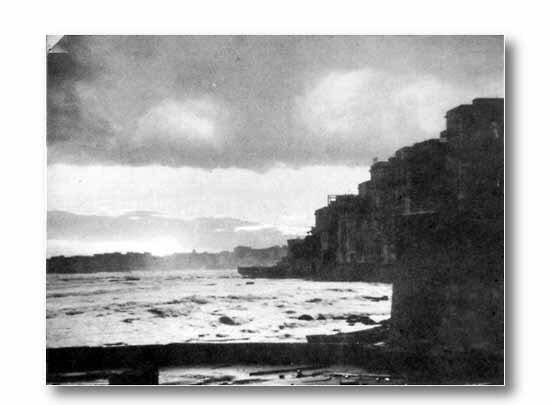 The Division sailed from Pozzuoli near Naples beginning on the 18th of May. Its first bivouac was in a wooded area east of Nettuno. Though traffic and army routine within the confining perimeter seemed normal, troops and headquarters were both living mole-like, underground. Enemy artillery was light and had been for the preceding two weeks. If notorious "Anzio Annie," the big German railroad gun, dropped in during this time it was not reported. The "Texas" Division, in reserve for the opening attack on May 23, followed up through Cisterna and entered the line at the approach to Rome astride the road to Velletri. 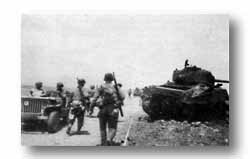 TROOPS AT ANZIO pass a knocked out M4 tank and a spot where some of the heaviest fighting had taken place. CISTERNA, once one of Italy's loveliest resorts, was badly battered in the. 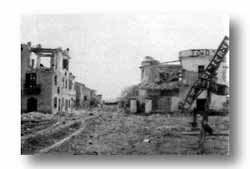 struggle, that ended the four-month-old Anzio beachhead.